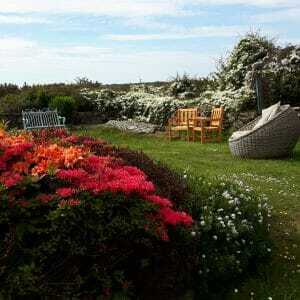 Tyn Llain is a luxury 3 bedroom B&B on the beautiful island of Anglesey. It is situated just 5 minutes from the sea, nestling in a peaceful rural location between Cemaes and Church Bay. We aim to provide a totally relaxing break. 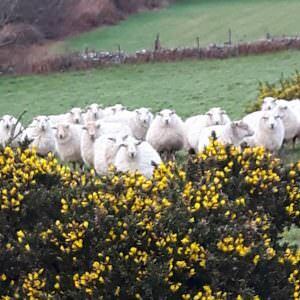 You are free to wander around the 6 acre small holding, which is home to sheep, pigs, ponies and hens as well as our 2 cats. 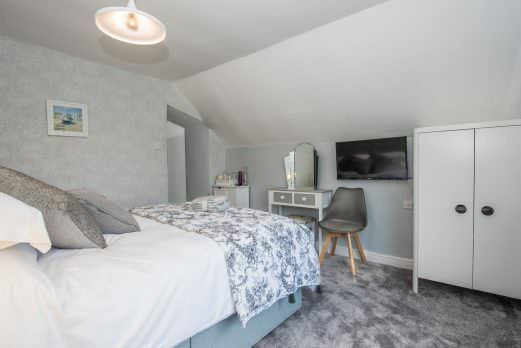 Alongside the homely comforts of homemade cake and bread, we offer the touches of luxury that make a memorable stay, such as high thread count bed linen, luxury Hypnos beds and soft fluffy towels. Thank you for your booking. See you soon! 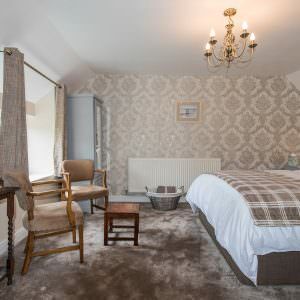 Tyn Llain is everything you need from a B&B. The room was lovely, newly decorated with a quirky bathroom. Really wanted to steal most of the features in the bathroom. The room was spacious with the most comfortable bed! Tyn Llain really pays attention to details with very accommodating tea and coffee facilities. The breakfast was really good using local produce and we would highly recommend staying here. 5/5 Trip Advisor. Recently returned from a stay at Tyn Llain. Lovely peaceful setting and made to feel really welcome by Russ and Nicky. A great place to stay, the room was great, spotlessly clean, comfy bed, quality linen, fantastic bathroom with a walk in shower. After a great nights sleep you will be able to look forward to a really good breakfast all cooked with local Anglesey produce. 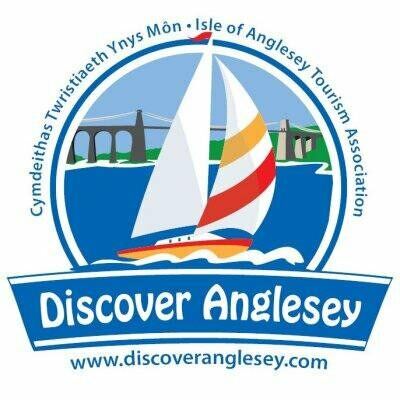 If you are looking for a bed and breakfast on Anglesey would definitely recommend a stay at Tyn Llain. 5/5 Trip Advisor. 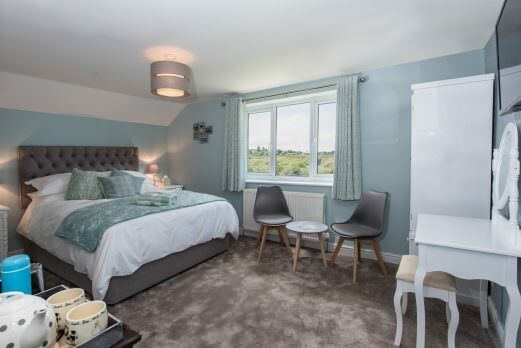 The largest of our rooms with a huge ensuite shower room including a twin basin workbench. 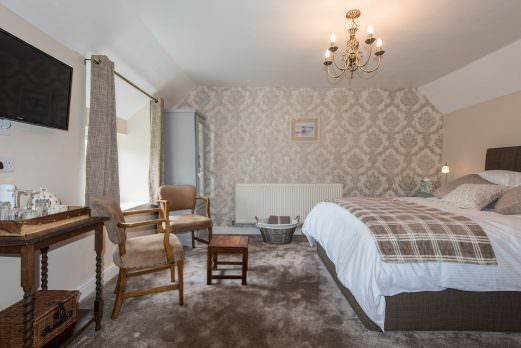 Both the bedroom and the ensuite have views across the garden and fields, complete with sheep and cows! This room is decorated in natural tones to enhance its romantic ambience. Decorated in tones of silvery grey, with views across the fields and surrounding landscape. The en-suite has a Butter Churn housing the basin and a sky light giving you magical views of the stars whilst cleaning your teeth! Fantastic views across the lake and beyond. 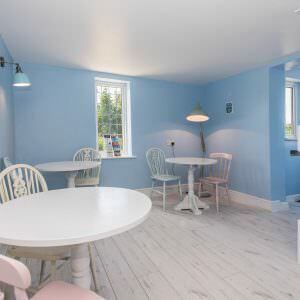 Mirroring the scenery, the room is decorated in peaceful hues of duck egg blue. The ensuite has a Singer Sewing Machine housing the wash basin. Copyright © 2017-2019 Tyn Llain Bed and Breakfast, Anglesey. Website by Mônality.